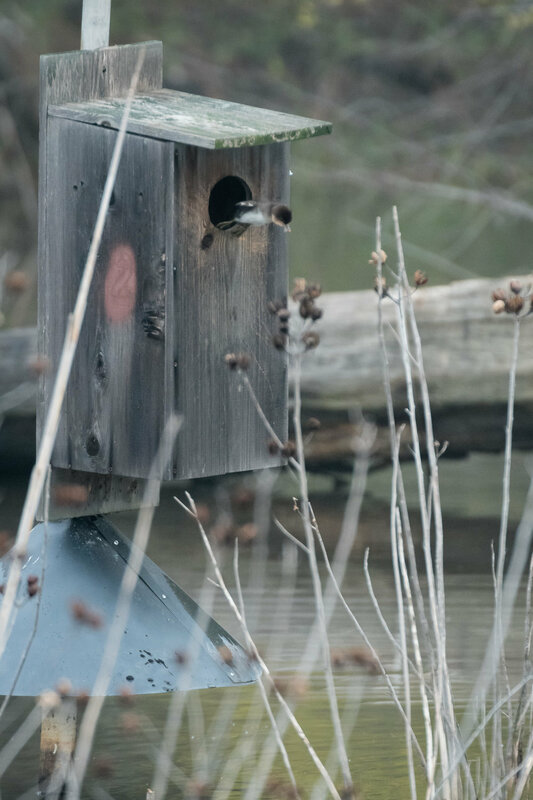 A swallow flies by, watching two little Hooded Merganser ducklings in their nest box. Sometimes when photographing or observing wildlife advanced planning is incredibly important. But other times pure chance, being at the right place at the right time, plays a much larger role. This post is about a recent experience where luck made all the difference. We were visiting a local wetlands park, one I often frequent. I knew of a nesting box occupied by a Hooded Merganser, so I set up on the boardwalk facing that box and watched for quite some time. No activity at all. So I continued on, seeing what else the wetlands would show me this day. I began photographing a couple Yellow-rumped Warblers flitting through the brush when I starting hearing a strange sound, something I’d not heard before. I can’t really describe it, but it seemed to grow in volume and there appeared to be more than one source. 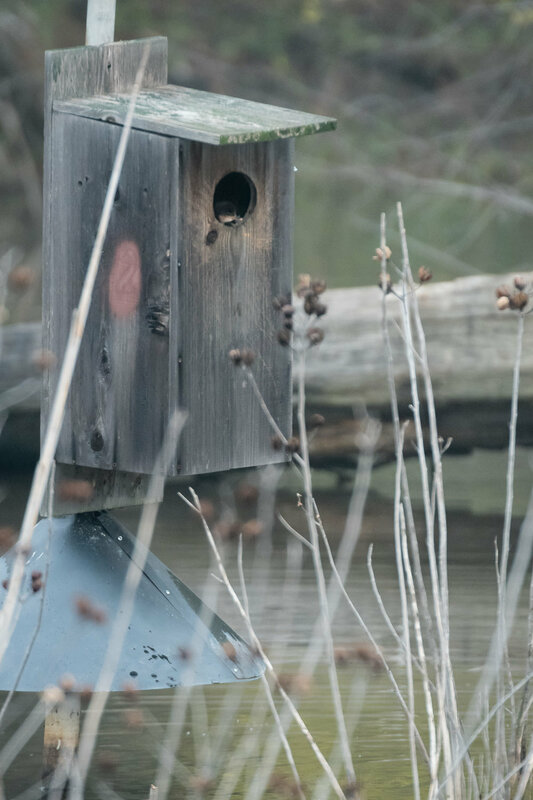 I turned around and my eye happened to catch movement at the entrance to the nest box of the Hooded Merganser. And what I saw was a waterfall of little puff balls falling from the nest box into the water below! The ducklings were leaving the box, and I just happened to be there to observe it. What were the odds I would be there at just that moment? Here is a sequence of images showing one duckling jumping from the box to the water below. Click on the image to cycle through the sequence. I wasn’t able to photograph the majority of the ducklings as they poured from the box, but I did manage to get my camera repositioned and moved in closer in time to capture a few of the chicks at the box entrance and jumping (or falling) to their siblings below. Here is another sequence of images, this time of a duckling falling from the nest box. Click on the image to cycle through the sequence. 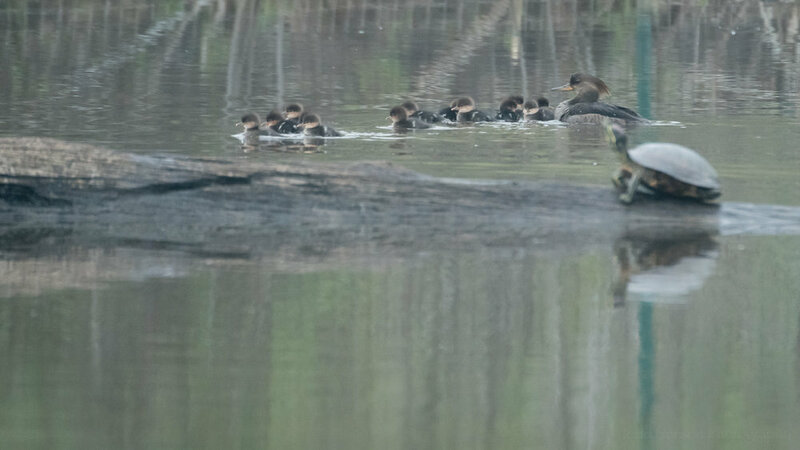 Just after the majority of ducklings had left the box the mother saw another female Hooded Merganser, apparently too close to the box. She attacked the other duck, making all kinds of noise, and driving the young ducklings in the opposite direction where they could hide in the brush. Hooded Merganser ducklings just out of the box, swimming away from the fight between their mother and another duck. When the mother had chased off the other duck she returned to gather her ducklings. They all huddled very closely together, likely to make them appear as one large bird instead of a number of small ones, hoping to fool any predators that might happen by. The group of merganser swam past an oblivious male Wood Duck and a turtle resting on a log before finally heading further out into the wetlands and beyond my view. Mother reunites with her ducklings. Hooded Merganser mother leading her ducklings through the brush. I can hardly describe how thrilled I was to be there watching this sequence of events. I was so excited I likely introduced some extra shake into the camera which may have resulted in less than perfect focus. It was also a very overcast morning with some remaining fog that hadn’t quite dissipated. Because of this I boosted the ISO to 1600 to let me shoot at 1/640th of a second. Perhaps I should have boosted it a little more. 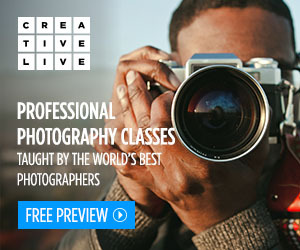 I set my aperture to f/7.1. I didn’t want to stop down too much because that would drop the shutter speed, but I also wanted enough depth of field to keep the entire family of ducks together. I might have been able to open the aperture a little more than I did. Hooded Merganser family swimming past an oblivious male Wood Duck (in the background). 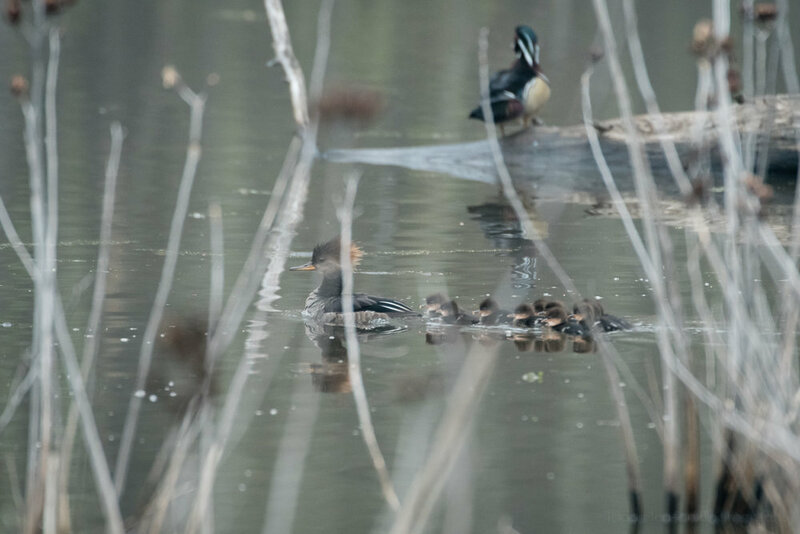 Hooded Merganser Family sticking together and swimming further into the wetlands. Overall I’m very pleased with having captured these images. 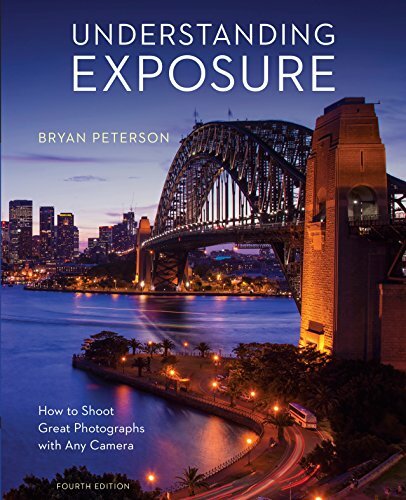 I don’t consider them great photos, by any means, but I do consider them photos of a great experience. 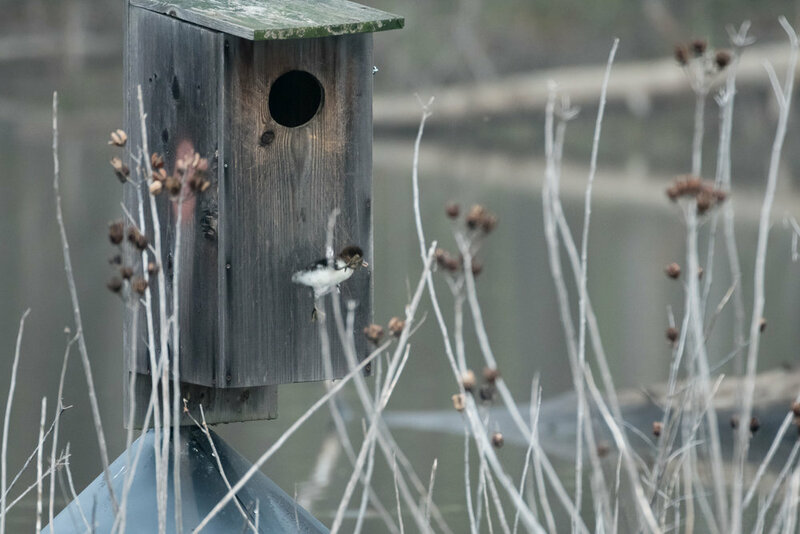 Have you ever been present when birds fledged the nest or left the nest box? What was the experience like for you? They briefly broke up when passing behind a turtle basking on a log. But they quickly came back together as a group before disappearing into the distance. When you hear a new, unusual sound seek out its source. You never know what you may find.